The odour and dust reporting program appears to have been completed. On Monday 15 and Tuesday 16 April, DWER will be reporting the results of the community odour reporting program to the volunteers who participated. CCL decided during the trial period to close its biggest kiln (no. 6) for ‘routine maintenance’ between 31 March and 16 April. No kiln = no odour/dust? We are awaiting advice from DWER as to when the other programs (Light Detection and Ranging [LiDAR] and Odour Patrols) will be completed and the results reported to the community. On 9 March we posted details of what our lab tests revealed about what is in the dust falling on homes in Beeliar and Yangebup. 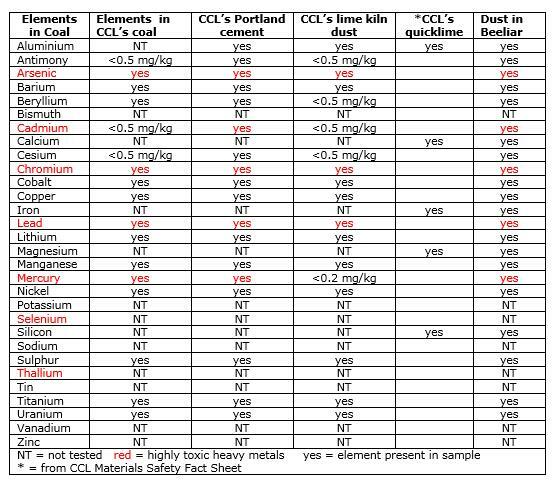 A Google search will reveal the health implications of exposure to these metals. On 25 March we posted the results of our recent Freedom of Information application seeking documents showing how CCL got its licence changed in 2006 to burn coal in its biggest kiln (Kiln 6) when previously it was required to burn only natural gas. The documents show CCL informed DOE (now DWER) on the last business day in 2015 that it had just been advised by its gas supplier that it could not supply enough gas for CCL’s needs and that its business was under immediate threat of having to close. CCL pressured DOE to agree to the change at a time of year when most people are on holidays and not paying attention to business matters. CCL claimed they needed 18 terajoules of gas per day to meet their production requirements but their gas supplier could only offer 12 terajoules. Our calculations suggest that 10.1 to 11.3 terajoules would have met CCL’s production needs. It looks like CCL grossly exaggerated its gas needs at the time so they could force DOE to allow it to use cheap and dirty coal. When the gas supplier later advised CCL they could meet all CCL’s gas needs, CCL then claimed their business would go broke if they had to use gas! On 8 April we posted extracts from information now published on the Department of Health (DOH) website about Cockburn Cement pollution. DOH refuses to investigate the many health complaints notified to it in writing by residents of Beeliar, Yangebup and Munster. DOH will do nothing, but if residents and their children get seriously ill now or in the future, DOE can deny any legal liability because they told residents to go to their GP. DOH’s recommendation is: HOPE FOR THE BEST!